That’s right: I’m going to start the new year talking about toilet paper. 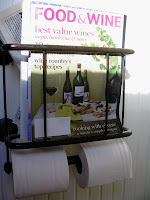 When we moved into our house, we put in this double roll holder (with magazine rack) because it meant there was less chance of running out. It also holds the big double rolls of Quilted Northern (our preferred brand), which we load so the paper comes over the top, not from underneath. The folks at Northern must spend a lot of time thinking about toilet paper (it is their job, after all) because they keep softening and expanding the rolls and, of course, there’s the quilting. For all of their efforts, however, I’ve noticed that one or two of the rolls that come in the giant twenty-four pack we buy from Target is just plain. No quilted design. Just a roll of plain white toilet paper. It happens enough that I wonder why it happens. I know it’s all done by machine, which I suppose there’s some sort of glitch in the process that allows a roll to escape decoration every so often, even though every other step is accomplished. And the folks at Northern have chosen not to fix it, or at least to let us all live with it. At the restaurant we get fresh sourdough bread everyday from a local bakery that is the bread supplier to most of the restaurants in town. They make awesome bread of most any kind and, if you go by the bakery on the weekends, they use the foccacia dough to make beignets. About three months ago, we began to notice that eight slices into each loaf is a slice that is double-thick, meaning one of the slicing blades is missing and has been for some time now. Like the folks at Northern, they have chosen not to fix it, or at least to let us all live with it. As I sit at the table on this first afternoon of a new year, I can look around the room and spot five or six familiarly unfinished things I have learned to live with rather than repair, much like my suppliers of bread and toilet paper. Some are bigger deals than others – unquilted paper works better than double-thick sandwich bread – yet they all serve as reminders that life is not what it could be were we choosing to live more intentionally. It’s been many years since I made a resolution to break in a new calendar, mostly because they, too, were left unfinished. I hesitate to resolve to fix the lampshade (three minutes with a hot glue gun), or hang the last of the pictures (probably twenty minutes with hammer and hangers), or finally organize the kitchen (a good afternoon, anyway) because I don’t feel like inflicting myself with the pressure of promises and yet I find myself bumping into the question I would like to ask the bakers and quilters: would it take that much to get things right? A second companion question quickly follows: what do we get out of not fixing the little things, out of getting used to things being broken? Though a small part would fix it, I choose not to repair the air conditioner on my again Jeep Cherokee, as much as I love the car, because they have to take the whole dashboard off to replace the small plastic piece and the labor costs would be more than the car is actually worth. Most of the little disrepairs in my life are not so costly. So what’s the pay off? Why do I chose to live among the ruins rather than repair? The first day of this year isn’t even over and I’m already dealing with big questions. P. S. — I inadvertently changed the template for the blog and I’m still trying to understand what I did and how to undo (or redo) it. You’ll notice I figured it out when the changes happen. OK … we are quilted, double-roll Northern people too, and I’ve never noticed this phenomenon. I’ll hustle to our storage cupboard to analyze our latest purchase, to intrigued not to. But what if my 24 pack is all quilted? Then we must ask, is this a test to see which regions of the country notice? Surely it’s not some Princess and the Pea like test!?! I spent the days up to New Years cleaning cluttered corners and hanging previously un-hung pictures for just the reasons you mentioned. I’m in a better frame of mind as 2009 begins because of it! we call it being “clutter blind” in the Turner family. Those things that never get fully finished and left and we just somehow seem never to notice it. I have thought that I need to find a friend who I love and loves me and switch houses with her for list making – and ask her to notice all of the things that would driver her crazy if she had to live in my house, while I did the same in hers. A fresh set of eyes can see things that we just gloss over ourselves.